But things aren’t perfect… Marie is an old woman and dying after her experiences. She may be alive but she will die soon… and when she does Tulip will die. Jody and TC say to save Marie they need a soul - and nominate Tulip. Time for another fight! But The Allfather, apparently head of the Grail, calls and demands Starr make plans for the messiah right now - because with god missing this is the time to do it. Starr shows off Humperdoo’s tap dancing skills which the Allfather takes as proof he is ready. Because he has low standards. 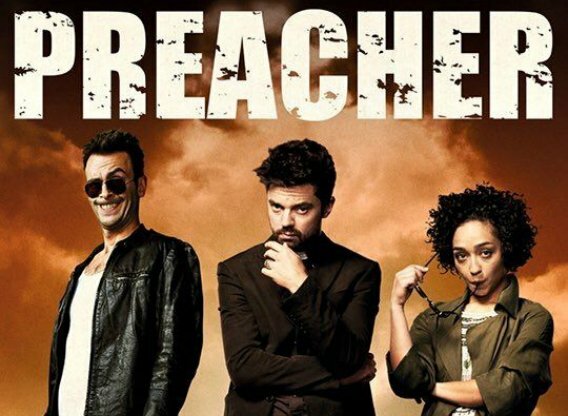 Ok I get that Preacher is just a manic collection of complete random weirdness a lot… but… it’s usually faintly amusing? While this isn’t - it’s cringeworthy. I mean, Humperdoo being incapable to rule is a plot point, but you can represent this without making such a complete mockery of developmentally disabled character. And I don’t get any point of the Allfather other than “look fat person.” Can we not. This coming trainwreck makes Starr doubly dedicated to getting Jessie back on side to be his messiah. Which is when Lara reveals she has a plan (and I love that everyone snaps at her for her dramatic pause). Cassidy isn’t in a great head space; he’s taking carfentanil and drinking and trying to date other vampires on a dating app. There are so many dating apps. Soooo many. But not so many vampires - and his date turns out to be a human wannabe who he duly intimidates with his very real fangs which is more than a little terrifying. Cassidy passes out, is captured by the Grail who manage to make him mumble his kidnapping video. But then he is rescued - by a cult of vampire wannabes called Les Enfants de Sange. Children of blood. Really. Cassidy is going to be SO SCATHING about these.